Fisher’s is a quality school that was started by Teresa (American) and Hai (Vietnamese). 13 years on, and they are still ‘hands on’ in the schools. They, together with all the staff, have ensured that the facilities and teaching materials are of a high standard. So often in Vietnam, ESL centers offer poor/old facilities, and so it was refreshing to see their lovely centers. Fisher’s is among the highest paying schools in the city. They are reliable employers, who offer set periodic raises based on performance. Work hard, and you’ll be rewarded! From when I first arrived, Fisher’s was committed to doing everything by the book. They will assist you with getting a work permit and a residency card - this helped me sleep a lot easier at night! The dedicated HR department (made up of Vietnamese and western staff) helped me take out medical insurance, and even open a local bank account that allowed me to do international transfers. The support that the HR department gives you when you arrive is incredible. Fisher’s employs full-time foreign Academic Managers that assist you with training and all classroom related issues. Besides this, there are numerous opportunities to get involved as ‘mentors’ for new teachers, and even to assist with syllabus development. The school organizes many voluntary social events where teachers can mix with their colleagues from the other centers in the city. I am a social person, and I loved this! This includes the western and Vietnamese staff. From a 2 day staff retreat (covered by school), to the TET end-of-year parties, it’s always a great atmosphere to meet new friends and travelers, and also to learn more about Vietnamese cultural observances. 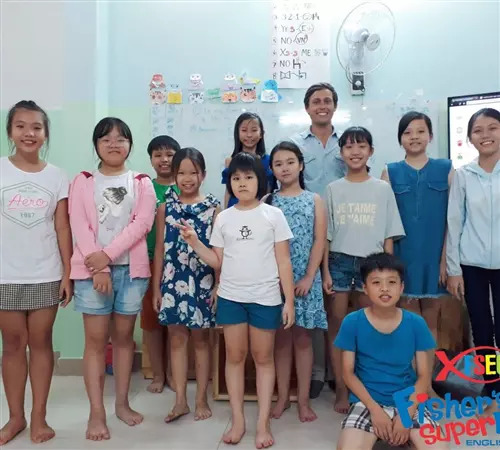 In my 3 years in Asia, this is the first ESL center that I have worked at that genuinely believes in giving back to the community that it exists in. There are numerous initiatives that you can get involved in. From beach clean-ups and upgrading rural village schools, to doing work in local old aged homes. Fisher’s also gives scholarships to less fortunate students. All these events are voluntary, and so it’s entirely up to you how involved you want to get. Da Nang is the best city in Vietnam to earn a good wage, while still enjoying a great quality of life. It has all the essentials of a big city, but it is also small enough to avoid all the major downsides of a bustling metropolis like Hanoi and HCMC. Also, Da Nang has a big community of foreign expats to mingle with. The airport is really handy, as is the amazing beach and surrounds! If I moved back to Vietnam, I would apply for Fisher’s again. It has all the great things that an ESL center should have, and often exceeds in many of the areas that matter!